Monaco, an independent state located on the French Riviera, has long been known for its luxurious lifestyle. No income or capital gains taxes, no double taxation agreements and high fiscal confidentiality make it an attractive country for high net-worth individuals. While Monaco is not part of the EU or the Schengen zone, residents enjoy visa-free travel within Schengen thanks to bilateral agreements. The country boasts excellent travel connections by road, sea and air, as well as a highly stable real estate market. Your spouse and children under 18 can be included in your application and gain residency in Monaco. Monaco’s residency-by-investment program grants permanent residency to successful applicants and their families, meaning you will have full rights to live, work, travel and run your business in Monaco. You must demonstrate that you have sufficient funds to sustain yourself and your family, and to ensure adequate accommodation. A proof of a clean criminal record is also required. A personal interview is part of the application process. After 10 years of residing in the country, you may apply for citizenship. An additional criterion for this is that you physically reside at least 6 months within a year in the country. Although Monaco is not part of the Schengen zone, residents can enjoy visa-free travel to all 26 Schengen countries thanks to bilateral agreements. 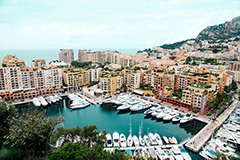 Residency-by-investment in Monaco requires a total investment of EUR 1 million. Half of this sum must be deposited in a Monaco bank, while the other half must be used to buy real estate.